I had a wind mitigation inspection and did not receive one or all of the credits on the form. What does the form mean and how can I get the discounts? In November of 2007, when the My Safe Florida Home program was still in place, the Uniform Mitigation Verification Inspection Form OIR-B1-1802 was created by the Florida Office of Insurance Regulation and the State-run Citizens Insurance Corporation. That program has long since ceased to exist but the State of Florida now requires that this form be the only accepted wind mitigation report that can be submitted for homeowners insurance discounts. 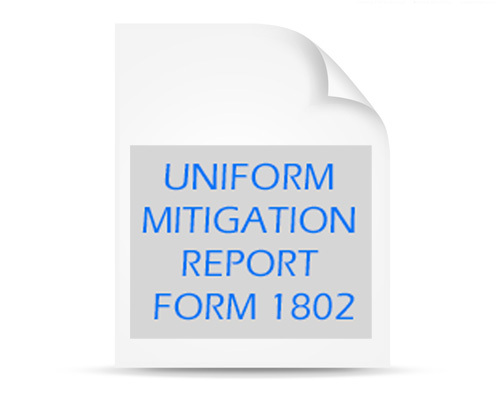 All other wind mitigation forms created by the various insurance carriers were eliminated. The Form OIR-B1-1802 was revised in February of 2010 and again in February 2012 with stricter wording and photo requirements. Technical revisions were made to the form on May 22, 2012 and April 10, 2014. All items in the report receiving a credit MUST have an accompanying photo clearly depicting the credited item and the item MUST meet the requirements exact verbiage as stated on the form. If a photo is not clear or obtainable you will most likely not receive any credit for that inspection item. For the roof covering credit, if the roof was not permitted, photos of roofing contracts or receipts can be substituted. In some cases, for construction features of the building, copies of blueprints may be photographed and submitted but this will not guarantee that the underwriter will give the discount for the intended construction process. (1) Building Code: As stated, this is the year that the structure or home was built and not when the roof was last replaced. The homeowner has no control over this attribute. Credits are only given if a home was built in compliance with the 2001 Florida Building Code which took effect March 1, 2002. For homes in Miami-Dade or Broward Counties, the building application date must be after September 1, 1994. (2) Predominant Roof Covering: This is one of the best discounts given on the form and pertains to a and pertains to a new or newer roof and any secondary roof over enclosed living space and/or structurally attached to the main roof applied for or installed on March 1, 2002 or later. As stated on the form, all roofs must meetthe 2001 Florida Building Code or the 1994 South Florida Building Code. The S.F.B.C. only pertains to homes in the Miami-Dade or Broward Counties area.If the roof(s) was not permitted, the roof covering(s) must be Florida Building Code or Miami-Dade County approved product(s) with the product approval number(s) listed on the form. (2) Predominant Roof Covering: This is one of the best discounts given on the form and pertains to a and pertains to a new or newer roof and any secondary roof over enclosed living space and/or structurally attached to the main roof applied for or installed on March 1, 2002 or later. As stated on the form, all roofs must meetthe 2001 Florida Building Code or the 1994 South Florida Building Code. The S.F.B.C. only pertains to homes in the Miami-Dade or Broward Counties area.If the roof(s) was not permitted, the roof covering(s) must be Florida Building Code or Miami-Dade County approved product(s) with the product approval number(s) listed on the form. Even if the roof(s) was replaced one year ago and there is no documentation to show the inspector, we must mark that item as “unknown or undetermined”. (3) Roof Deck Attachment: This section refers to how many staples or nails are holding your plywood roof deck to the top of your truss system. The nail pattern used will depend again on when the roof was last replaced. The three common options are listed on the form with (A) being the weakest and (D) being the strongest form of attachment. The inspector must have unobstructed access in the attic to obtain and clearly photograph this information. As of October 1, 2007, the Florida Building Code requires that roofing contractors re-nail the roof deck for existing homes built before the 2001 Florida Building Code (3/1/02) took effect with 8d ring-shank nails 6″ along the edge and 6″ in the field. The inspector will measure the length of visible nails and also the spacing of the roof deck nails and photograph to document the weakest attachment that he finds. (A) toenails which are the weakest, (B) clips (usually wood frame homes), or (C) single wraps which are the strongest of these three. Option (D) double wraps is rarely found but is much stronger than single wraps or clips. Option (E) Structural is usually for multi-story buildings with concrete roof decks such as condominiums. The best credit usually given is for the properly installed single wrap conforming to theminimum requirements specified on the form.When referring to this section, please read the heading very carefully. It asks, “What is the weakest roof to wall connection?” What this means is if you have single wraps on most of your trusses, but one (or possibly a few) of your trusses have clips, it must be downgraded to clips. The same thing applies to clips, if one truss or more have no clip installed, it must be downgraded to toe nails.The other problem that can occur is that if, by chance your single wraps are offset from the truss (meaning when they come out of the concrete tie beam and are not set following the manufacturer’s or industry specifications), the form must be marked as “A” Toe Nails because they do not meet the minimum requirements. (5) Roof Geometry: In the insurance industry, there are only three roof shapes: hip, non-hip or flat. A hip is a shape that resembles a pyramid (sloped on all 4 sides) and gives the best credit. If any other roof shape interferes with this shape that is longer than 10% of all the added edges of the roof line, it must be called out as non-hip.If you have a flat roof deck portion that is attached and tied into the main roof structure and is greater than 100 square feet or larger than 10% of the entire roof, the roof must then be marked as “other”. (6) Secondary Water Resistance (SWR): This is a self-adhering waterproof product used when the old roofing material is torn off down to the plywood roof deck. This product differs from 30# felt as it does not use nails to hold it in place. If the roof covering is torn off, this product can protect the interior of the home from water damage. We can try to determine if a S.W.R. was installed by viewing the bottomside of the roof deck where the plywood sheets come together or around roof vents. The product has a shiny appearance and the adhesive substance can be detected. Please visit the Florida State Website for more information. The insurance carriersThe insurance carriers also require additional proof of the S.W.R. by having photographs of the product information and/or the receipt from the roofing contractor showing it was installed and paid for. (7) Opening Protection: When referring to this section, again please read it very carefully. 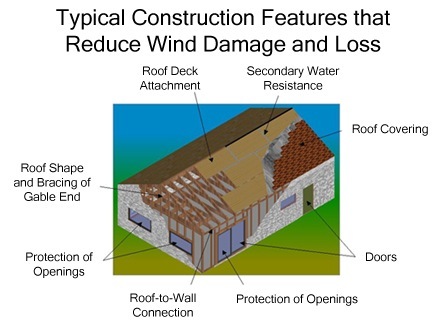 “What is the weakest form of wind borne debris protection installed on the structure?” This section of the report is very specific on the requirements. The hurricane protection products installed on the structure or located on site must meet one or more of the requirements listed in section A. Additionally, a garage door must also must meet the ANSI/DASMA115 (for large missiles). All of the products must have either stickers, stamps, imprints or etchings in window glazing showing its rating or product approval code. If you have paperwork from the installer showing the product approval codes that can be photographed ,that, is also helpful if the stickers, etc. can’t be viewed or have deteriorated. Skylights, non-impact windows located on hurricane rated garage doors, front entrance doors with ½ moon glazing, glass block without mortar between the blocks and doggy doors can cause the report to be marked as (J) “At least one glazed opening does not have wind-borne debris protection.” This will cause you not to get any discount for this section of this report.